DOYLE, LAURENCE (Lawrence) O’CONNOR, lawyer, editor, and politician; b. 27 Feb. 1804 in Halifax, N.S., eldest son of Laurence Doyle and Bridget O’Connor; m. in 1833, on Île Madame, N.S., Sarah Ann Driscoll (d. 25 Jan. 1841); d. 28 Oct. 1864 in New York City. For Laurence O’Connor Doyle, the son of a Roman Catholic merchant in Halifax, educational opportunities were limited: the Halifax Grammar School was under Church of England supervision and King’s College at Windsor, N.S., required its students to adhere to the 39 Articles. Doyle, therefore, spent seven years at Stonyhurst College, a Roman Catholic institution in Lancashire, England, before returning to Halifax in 1823 to study law with Richard John Uniacke*, the old attorney general. 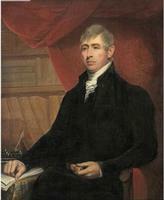 While still a student in Uniacke’s office, he prepared the Roman Catholics’ petition to the assembly for modification of the test oath. On 22 Jan. 1828 Doyle became an attorney and on 27 Jan. 1829, a barrister. Thereafter he practised law in Halifax. Meanwhile, along with Joseph Howe*, Thomas Chandler Haliburton, and others, Doyle had become a member of “The Club,” a literary society in imitation of the “Noctes” in Blackwood’s Magazine in Britain. Its humorous, vigorous satires on the follies and affectations of the day appeared irregularly in the Novascotian between 8 May 1828 and 23 June 1831. As time passed Doyle became something of an incorrigible punster, and was regarded by Howe as the wittiest man he had ever encountered. It was natural for a young man of Doyle’s position, personality, and talents to become involved in the stirring political issues surrounding the struggle for responsible government. In 1832 when three new constituencies were added to the existing two in Cape Breton Island (one for Cape Breton County, one each for Arichat and Sydney townships), Doyle decided to run in a by-election for Cape Breton County. 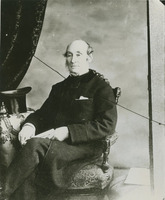 After visiting the island, however, he chose the Arichat seat on Île Madame, because, as he later said, “I would be equally honored by representing the only Catholic Township in the Province, as by representing the largest County.” Doyle’s political ally, William Young*, offered himself for one of the two Cape Breton County seats, and resentment against these two outsiders from Halifax was heard on the hustings. Furthermore, longstanding jealousies between Arichat and Sydney were revived, partly because the latter had been made a free port during a resurgence in coal mining in 1828. Doyle decided his chief opposition would come from the supporters of Richard Smith, superintendent of the General Mining Association, an English company based at Sydney, and a candidate for one of the two Cape Breton County seats against Young and James Boyle Uniacke*. Doyle felt that Smith was the agent of an all too powerful body in the province, and that the rest of the island would be deprived of fair representation by Smith’s connections with Sydney. Doyle campaigned in both ridings. He, Young, and Uniacke were returned, but Young’s election was contested and Smith ultimately declared the winner. Doyle quickly became recognized in the house as a convinced Reformer. He argued that Cape Breton Island deserved more than five members in a 44-seat assembly because its “area and population . . . were equal to 1–5th of the whole Province.” In 1834 Solicitor General Charles Rufus Fairbanks* submitted a scheme for improving the great roads of the colony by borrowing £100,000 in England. Doyle seized the occasion to advocate changes in the road and bridge service. Traditionally mhas had the right to allocate the sums of money for the great roads and divide the remainder among the counties for the maintenance of their crossroads, as well as to designate road commissioners in their constituencies. Doyle strongly favoured Fairbanks’ proposal to take away this patronage which, in his opinion, had engendered corruption, but the house was unwilling to abandon the practice. Doyle also claimed that Cape Breton Island needed at least 200 miles of great roads, and that opening communications would thrust the island forward half a century. Doyle continued these reform initiatives after his re-election for Arichat Township late in 1836. He strongly supported Howe’s 12 resolutions of 1837 which culminated in an address to the crown demanding an elective legislative council, and was dissatisfied with the 1838 decision of the colonial secretary, Lord Glenelg, to create separate Executive and Legislative councils but to make no substantial change in their composition. To strengthen the people’s control over their representatives, he sponsored the Quadrennial Act for an assembly term of four rather than seven years; passed by the assembly in 1837, it did not become law until 1840. In the 1840 elections Doyle again offered himself as a candidate in Arichat Township, but withdrew in favour of Henry Martell, thus honouring a four-year old agreement with his Acadian constituents to support Martell when he came forward. Doyle was not in the house again until 1843. 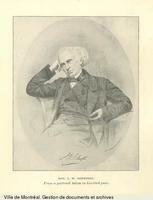 Meanwhile the Nova Scotian Reformers were encouraged by Lord John Russell’s dispatch of 16 Oct. 1839, according to which councillors were thenceforth to be appointed “during pleasure,” or on a political basis, according to their usefulness to the lieutenant governor; by the recall of Lieutenant Governor Colin Campbell* in 1840; and by the fact that James Boyle Uniacke had come over to their side. Not all the Reformers, however, approved of the decision of Howe, Uniacke, and James McNab to join a coalition government with James William Johnston* and the Conservatives in that year. Doyle agreed with Herbert Huntington*’s refusal to accept office, because, as he later stated, not enough Reformers were included in the coalition. During the early 1840s Doyle increased his interest in Irish affairs. He had been a member of the Charitable Irish Society of Halifax since 1828, serving as vice-president in 1828–29, 1838–41, and 1846–47, and president in 1829–32, 1843–44, and 1847–48. 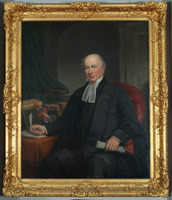 He was also the first president of the St Mary’s and St Patrick’s Temperance Society of Halifax in 1843. Moreover, he was an ardent advocate of the repeal of the union of Great Britain and Ireland. Repeal agitation had been revived in Ireland in the early 1840s by Daniel O’Connell, who was imprisoned in 1843. During that year Doyle presided at meetings in Halifax of the Repeal Association, was a member of its correspondence committee, and was editor of the Register, a Halifax newspaper devoted to Ireland’s affairs, at least from 10 Jan. to 30 May 1843. The following spring he took over the political department of the paper. At the time of the 1843 election Doyle was concerned that the Roman Catholics and Irishmen of Halifax were being viewed with “distrust” by their Liberal allies: “Our nationality, too fervid and impassioned it was said, has given umbrage even to some portion of the Liberal Press . . . .” Doyle was to have been a candidate for Halifax County but the four sitting mhas were eventually renominated for the Reform interest and the Catholic community was passed over. Doyle was convinced that his repeal activities were responsible and was reported as complaining that it was “illiberal and unjust, that the whole Catholic population of the Town should be disfranchised because he sympathized with his countrymen in Ireland.” The Catholics did not participate in the election, and were thus partly responsible for the defeat of the Reformer William Stairs by the Tory Andrew Mitchell Uniacke in Halifax Township. But, with elections not yet simultaneous in all constituencies, a reconciliation brought Doyle onto the Reform ticket with Howe in Halifax County; they were elected without opposition. This brief Catholic defection may have helped the J. W. Johnston ministry to retain office from 1843 to 1847. Late in 1843, disillusioned by the turn of events, the three Reformers left the coalition government, and the final stage in the struggle for responsible government began. The Reform party won the election of 1847 and Doyle was successful in Halifax Township. He became a member of the new Reform ministry on 2 Feb. 1848. On 2 Oct. 1850 he resigned from the Executive Council, though he continued to represent Halifax Township from 1851 to 1855. Doyle’s interest in reform and in local concerns continued. He long favoured a general system of education available to all classes, urging it in the assembly as early as 1840. He supported Horton Academy at Wolfville, N.S., but opposed the creation of a college there because he believed the colony did not have the resources requisite for the support of a university. In 1845 he sponsored a motion in the assembly against the improvident practice of endowing sectarian colleges. Like many Liberals, Doyle spoke out against the pressure temperance societies were exerting on politicians. He used his powers of ridicule to label as claptrap the talk of members of the house who advocated temperance yet scrambled for the money from duties on rum. In 1844, when the legality of the 1820 reannexation of Cape Breton Island to Nova Scotia was in question before the Judicial Committee of the Privy Council, Doyle spoke for his former constituents: “If rights had been wrested from the inhabitants of Cape Breton contrary to their wishes, and they now desired self-government, let them have it.” Doyle also took a leading part in an effort to widen the franchise from its base on 40s. freehold and to end the practice of temporarily transferring freeholds in order to create votes. In January 1851 he sponsored an act for better regulation of elections, which extended the franchise to those males who had paid poor or county taxes in the year before an election. But while some evils were eradicated by this measure, it was itself subject to abuse, especially in the preparation of lists of ratepayers and receipts for taxes. Over many years Doyle asserted the rights of the province to its mineral resources, then entirely controlled by the General Mining Association. In 1850 he was appointed to a committee on mines and minerals with responsibility for reviewing this company’s activities in Nova Scotian coal mining. The committee recommended an appeal to the Judicial Committee of the Privy Council to clarify the company’s legal rights and to the British government to end the monopoly. Eventually, in 1858, arrangements were made to terminate the monopoly and give the province control over the coal mines. Like many others Doyle was interested in railway development, and he saw it as assisting another of his concerns: a “closer and more intimate union” within a strong British empire. PAC, MG 24, B29, 2, pp.404–6; 55, p.48 (mfm. at PANS). PANS, RG 1, 175, p.505; 176, p.31; 259, doc.94; RG 5, GP, 11, request for appointment, 25 April 1828; RG 7, 34, L. O. Doyle to L. M. Wilkins, 26 Aug. 1855; Vertical mss file, J. B. Uniacke to Neil McDougall, 12 April 1832. St Peter’s Roman Catholic Church (Halifax), records (mfm. at PANS). Albyn [Andrew Shiels], The preface, a poem of the period (Halifax, 1876). Howe, Speeches and letters (Chisholm). [Joseph Howe], The speeches and public letters of the Hon. 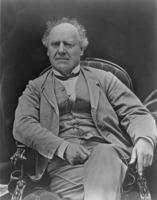 Joseph Howe, ed. William Annand (2v., Boston, 1858). N.S., House of Assembly, Debates and proc., 1855. Acadian Recorder, 10 Nov. 1832, 9 Nov. 1833, 25 March 1837. British Colonist (Halifax), 14 May 1855. Christian Messenger (Halifax), 10, 24 Nov., 1 Dec. 1843. Colonial Standard (Pictou, N.S. ), 8 Nov. 1864. Guardian (Halifax), 4 Nov., 2 Dec. 1840; 27 Jan. 1841. Halifax Journal, 12 Nov. 1832. Halifax Reporter, 1 Nov. 1864. Mechanic and Farmer (Pictou, N.S. ), 18 Nov. 1840. Morning Chronicle (Halifax), 22 March 1844. Novascotian, 1832–55, 7 Nov. 1864. Nova Scotia Royal Gazette (Halifax), 27 Jan. 1841. Register (Halifax), 1843–46. Sun (Halifax), 12 June 1848. Times (Halifax), 5 Feb. 1839. Weekly Chronicle (Halifax), 13 April 1821. Belcher’s farmer’s almanack, 1847, 1849, 1855. Beck, Government of N.S. J. G. Bourinot, Builders of Nova Scotia; a historical review, with an appendix containing copies of rare documents relating to the early days of the province (Toronto, 1900). Anthony Traboulsee, Lawrence Kavanagh, 1764–1830; his life and times, including brief sketches of the history of Nova Scotia (Acadie) and Cape Breton Island (Isle Royale) . . . (Glace Bay, N.S., 1962). George Mullane, “A sketch of Lawrence O’Connor Doyle, a member of the House of Assembly in the thirties and forties,” N.S. Hist. Soc., Coll., XVII (1913), 151–95. D. J. Rankin, “Laurence Kavanagh,” CCHA Report, 1940–41, 51–76. Charles Bruce Fergusson, “DOYLE, LAURENCE O’CONNOR,” in Dictionary of Canadian Biography, vol. 9, University of Toronto/Université Laval, 2003–, accessed April 24, 2019, http://www.biographi.ca/en/bio/doyle_laurence_o_connor_9E.html.